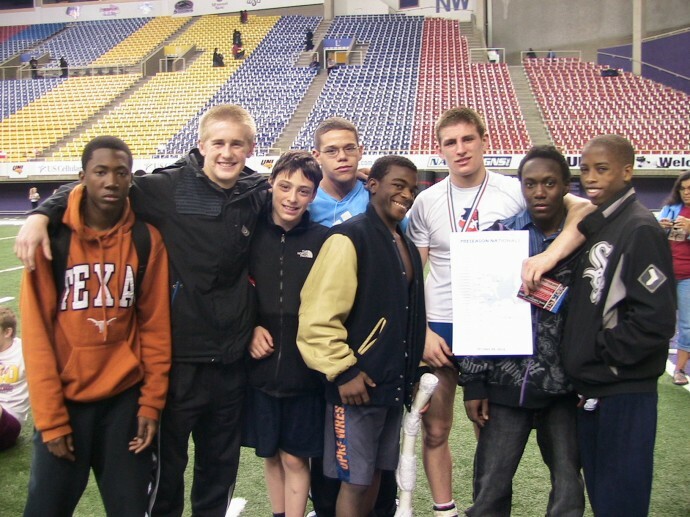 The five and a half hour ride to Cedar Falls, Iowa for the 2010 USA Wrestling Preseason Nationals was not anywhere near as much fun as the ride home. On Friday, October 29, Coach Mike Powell drove four OPRF wrestlers in his SUV, while Caryn Brooks and I followed with four more wrestlers in her truck. Her youngest son, Sam, and my youngest son, Colin, were with us. They're best friends, both juniors at Oak Park-River Forest High School. Everyone was starving; the eight of them-- Chris, Darius, Cameron, Matt, Donald, Linear, Colin and Sam-- each needed to make weight at 6 p.m. Colin was to make 135, Sam 171. We packed turkey sandwiches, fruit and Gatorade for the instant each wrestler had his weight checked. No one talked too much. They chewed a lot of gum. On Saturday, 25 wrestling mats bustled with more than 1,500 wrestlers in youth and high school matches. Colin lost his first match to Joey Munos out of Minnesota, who ended up taking first place for the tournament. Colin won his next match 14-1 and a third 8-2. He lost the fourth match 8-1. After two losses, you are out. But Sammy was still going strong. To keep the boys' energy going through the morning, afternoon and evening, we smuggled in apples and oranges, Clif bars, grapes, whole wheat bagels, all natural peanut butter, granola and tangerines. We would have loved to get more inside, but our pockets would have given us away. I put the jar of peanut butter in my camera bag. The security guards checked bags and purses for forbidden food, confiscating homemade offerings from anyone they caught and pointing us instead to the food stands with $3.50 Gatorade bottles, $3 water and $5 walking tacos. The concession stands featured pizza and bratwursts, hot dogs, popcorn and nachos. Not so great a diet for a wrestler who stays put in an arena for up to 14 hours and wrestles as many as five or more matches. Sam's was a 32-man bracket and he injured his thumb in the first match, thought he broke it. But with ice and tape he kept going. Finally Sam was up against Jake Waste for first place; Waste is a familiar competitor from Apple Valley, Minnesota. And Sam, who won 1st in Illinois's individual state in 2010, is a four-time All-American and the Fila cadet national champion in in 2009, won over Waste in the last few seconds. As they say, the crowd went wild. "I actually didn't know I was going to win, but I felt different," Sam said later. "I was just going to stay in his face, and then I noticed there were only seven seconds left and for some reason, I didn't panic. Usually I panicked and this time I didn't. I just knew it was going to work." His mother, Caryn, almost missed his win. "It's funny that I spent all day looking forward to it, with two days leading up to it, and the very moment that the championship hinged on, the moment I really wanted to see, I missed because I was distracted by another mother talking to me, " Caryn said. Sam headed to the awards stand, and after he posed for his photo with the other placers, the seven other members of the OPRF preseason team stood on the stand with him. As he said he would, Coach Powell treated the 171 pound national champion to a milkshake at IHOP, while the boys ate pancakes, chicken sandwiches and burgers and laughed. We left early the next morning for the two-lane trip out of Iowa, across the Mississippi River and past the postcard-perfect hills of Galena, Illinois and into Chicago. What a fun ride home. Good to see Darius and Colin’s million dollar smile in that picture. But even better to so the huskies travling and compeating at such a high level. That is really the best part of wreslting, I still remember a very similar trip to Waterloo Iowa. 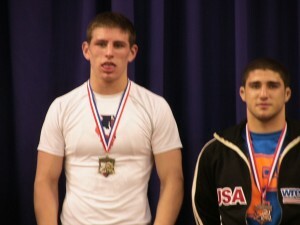 That was the first place that I realized that if just do what i can do I can compeat against any wrestler.